Escape the bustle of the city and enjoy a full day at sea with up to 4 friends or family members. Cruise around the historic harbour of La Rochelle, get up close to the Boyard sea fort or sail out to explore the beaches and bays of nearby Île de Ré or Île d’Aix. 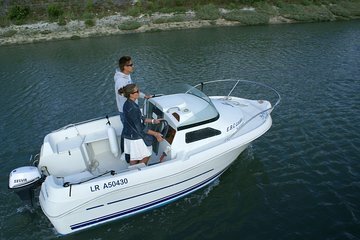 Best of all: these comfortable, easy to drive motor boats don’t require a license, so everyone can enjoy a taste of life at sea!